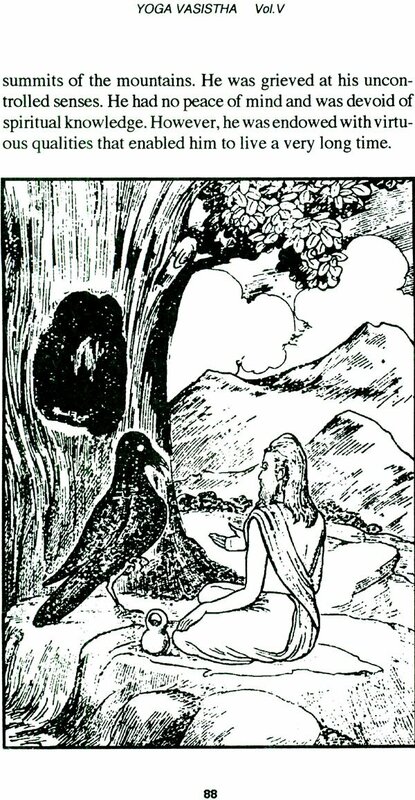 Yoga Vasistha can bring a complete transformation in human personality; even like the beggar of old fairy tales who turned into a King when a charmed golden ring fell into his hand; just so, whosoever holds this book, turning the pages with an inquisitive mind and a heart searching for truth, will discover the infinite beauty of his inner Self. Yoga Vasistha nourishes the soul and awakens a yearning for freedom and an exquisite peace unknown before. This unique book par excellence has been long awaited by advanced Vedantins and Yogis of India, because it is only available in rare editions of the last century. 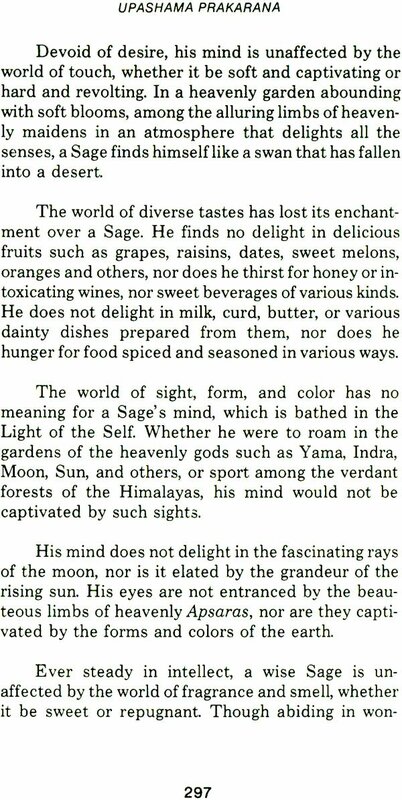 And it is what the enquiring mind of the West has been desperately needing since they heard he remarks of Schopenhauer, "In the whole world there is no study so beneficial and so elevating as that of the Upanishads. It has been the solace of my life; it will be the solace of my death." 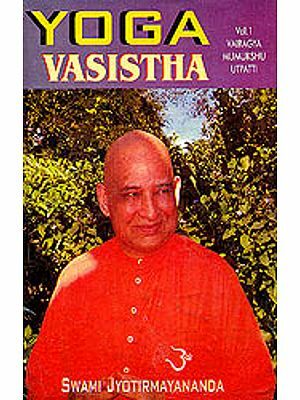 There are a few publications at present which are not sufficient to portray the total beauty and wisdom of Yoga Vasistha. H.H. Sri Swami Jyotir Maya Nanda, internationally known lecturer and writer of over fifty books on Yoga and Vedanta philosophy, has been interpreting and commenting on Yoga Vasistha for almost 25 years: first in India for 9 years at the Yoga Vedanta Forest Academy, Sivananda Ashram, Himalayas; in Vedantic conferences in Amritsar, Ludhiana, and other parts of India, and also in Dehradun Women's College. 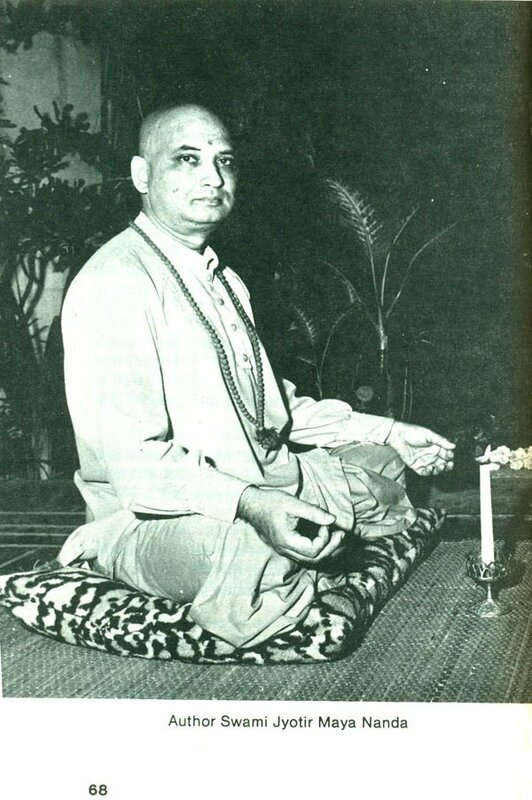 Since coming to the west, Swamiji had been lecturing in Puerto Rico for six years, followed by his weekly lectures here in Miami. Available on tapes and cassettes, these lectures are an undying treasure. We are presenting an abridged version of Yoga Vasistha in two volumes. 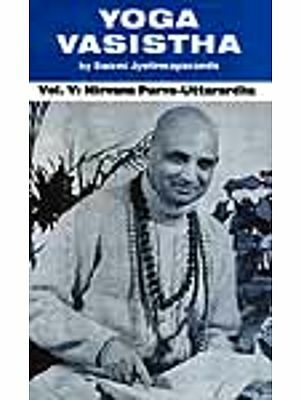 The first volume contains: Vairagya Prakarana, Mumukshu Vyavahara Prakarana, and a portion of Utpatti Prakarana. After a brief encounter with Yoga Vasistha, the reader will feel that all other books of philosophy have become like old crumbs on the table, while Yoga Vasistha stands like the sweet, vitalizing elixir of life. If I could have only one book for some extraordinary reason to read for the rest of my life, I would choose Yoga Vasistha; just as King Shah Jehan had the choice of only one type of food-grain while he was imprisoned for life, and he chose the chickpeas (garbanzo beans) because of its nourishment and adaptability to a variety of tasty dishes. 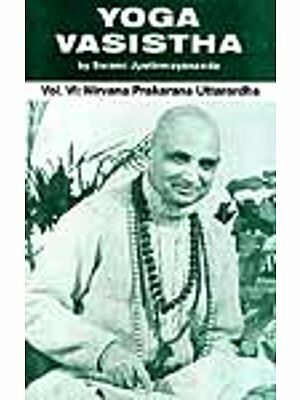 Yoga Vasistha encompasses in its powerful literature the dramatic stories of the inner states of the mind, and like a brilliant advocate, presents its brief with a convincing voice and expert phrasing, and with its mystic strategy convinces the mind to undermine its fancies and imaginations leading to the realization that the world lies within the mind. Nothing is more inspiring and soul-stirring as when the mind lifts itself from the quagmire of false perceptions of the senses, and sees the contents of waking, dream and deep sleep as the refractions of the Light of Consciousness filtering through the layers of egoistic illusions. The awe-inspiring awakening of the knowledge that "You are not this body, not this mind, and not this intellect" is uplifting and produces a vital change in the overall perception of the world. 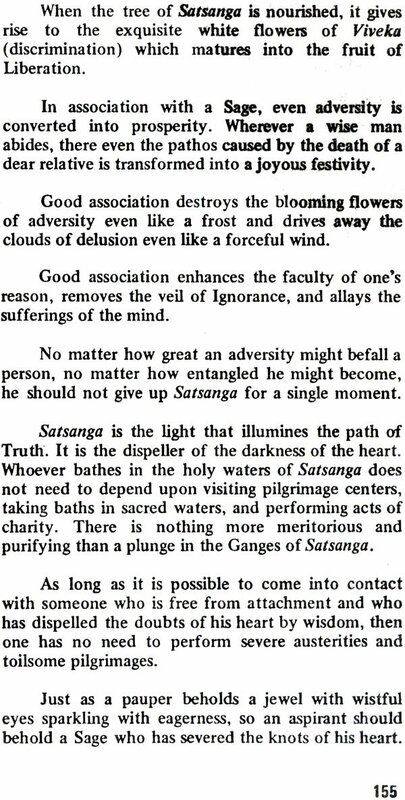 it is for this reason Sages warn immature aspirants against the wrong interpretations of this grand philosophy; they emphasize the fact that the wisdom of the Yoga Vasistha must be received under the guidance of an illumined teacher. 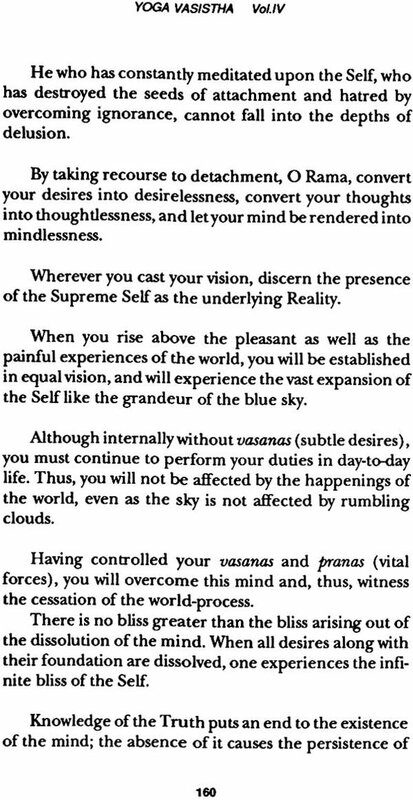 For those who are endowed with a mighty strength of intellect, and intense dispassion, Yoga Vasistha brings for them the clouds of mystic understanding that bursts into the flood of unique bliss. 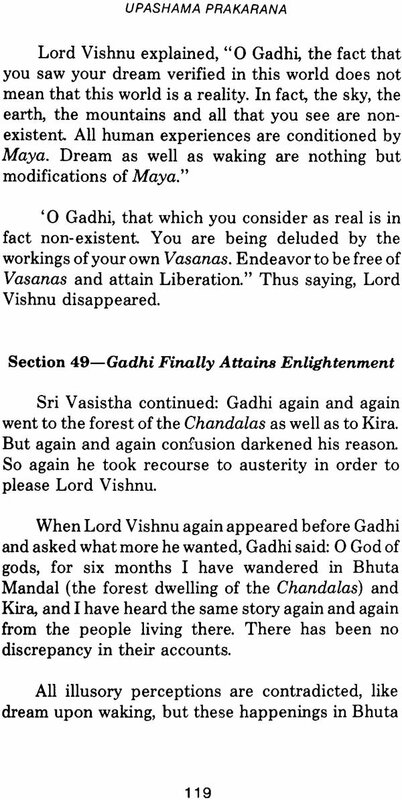 Due to the unfortunate lack of knowledge of Yoga Vasistha, the intelligentsia of the West have been unable to realize the vast treasure of profound knowledge that lies hidden in this great work. 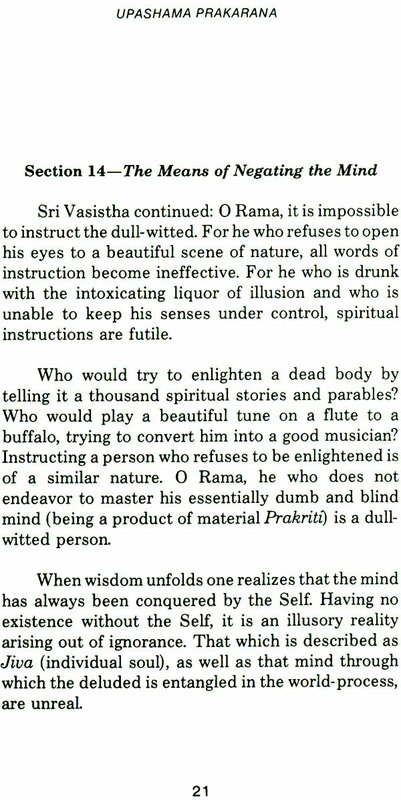 Because of this reason, the wisdom of Vedanta has not been deeply understood and assimilated by them. 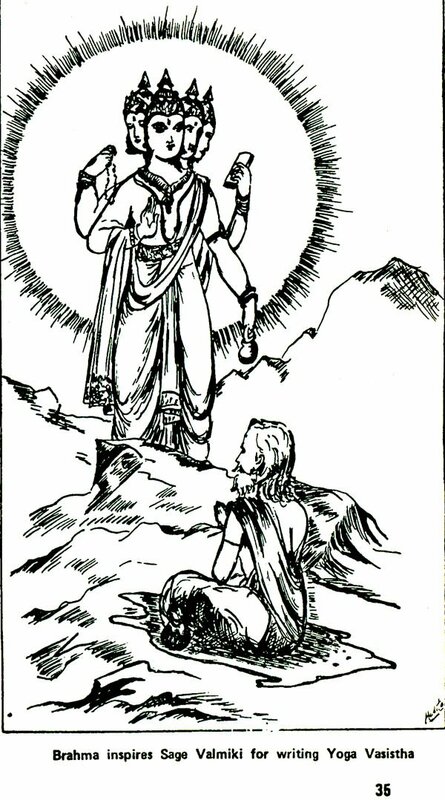 Yoga Vasistha in its broad spectrum encompasses topics such as: the mysteries of the soul, death and reincarnations, the psychic powers, the mystic energy known as Kundalini, the subtle operations of the unconscious mind which bring about repeated embodiments ad the techniques of spiritual enquiry and meditation. With his deft hand and eloquent pen, Sri Swami Jyotir Maya Nanda gives to the world his most memorable writing which has been guarded as a secret mystic wealth by the Sages of India for a long time. The greatest literatures of the world have always incorporated in their writings parables, illustrations, and stories to bring about a striking impression, even like that of a lightning flash, upon the sleeping mind in order that it may awaken sharply to the light of the truth. Yoga Vasistha abounds with these. It is to be noted that humor and wit permeate the writings and lectures of Sri Swami Jyotir Maya Nanda. They are like the green creeper adorning the tree of liberation. A studious reader will meet for the first time a challenge to his intellect to discover the secret wealth of the Self, and to explore the mysteries of the mind. This book, written by Sage Sri Swami Jyotir Maya Nanda, presents you with the key to heavenly bliss and perfection; and every page of this book is filled with his blessings. May the golden sun of your eternal Self rise from behind the horizon of distractions and mental limitations and encompass you in the greatest beauty and sublime love which are the very essence of your real Self. 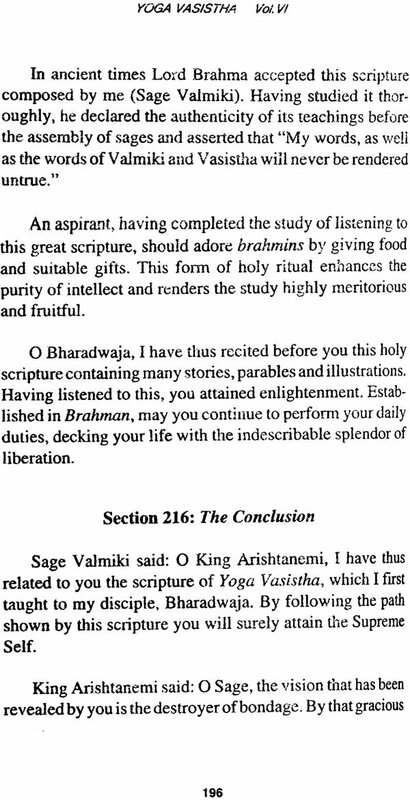 The Yoga Vasistha Maha-Rilmayana, one of the greatest of all Hindu scriptures, is virtually unknown in the West, due to the scarcity of its English translations. This vast work of approximately thirty-two thousand verses (sixty-four thousand lines) supplements the epic poem, the Ramayana, which is more popularly known throughout India and the world. In the "Bala-Kanda" section of the Ramayana, it is stated that Sri Rama was given spiritual instructions by Sage Vasistha . 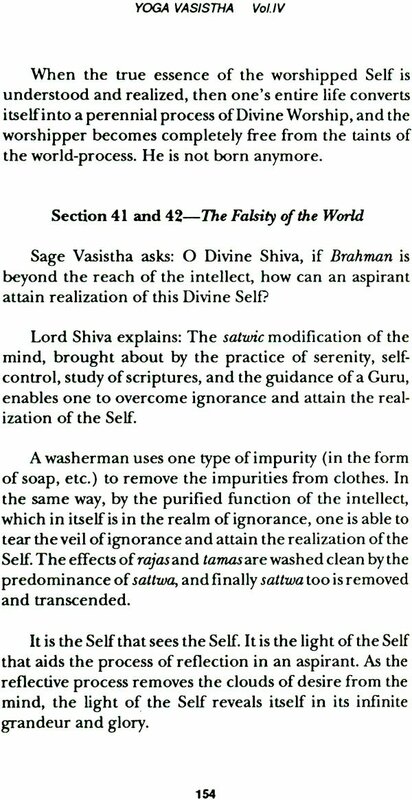 Yoga Vasistha is that teaching. 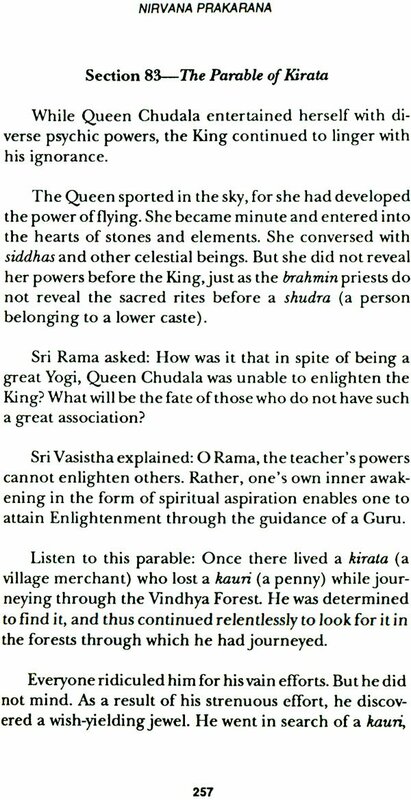 Whereas the Ramayana describes the epic life and adventures of Sri Rama, the Yoga Vasistha presents his inner realization in detail for those who wish to intensify their spiritual life and deepen their understanding. The Yoga Vasistha is also known by the following names: Maha-Ramayana, Uttar Ramayana, Arsha Ramayana, Jnana Vasistha, Vasistha Ramayana, and Vasistha. Whatever you choose to call it, it is the earliest detailed work of Yoga- Vedanta. 'and gives a magnificently detailed exposition of the subtleties and insights of that philosophy with a majestic sweep that has never been equalled in any metaphysical work since. 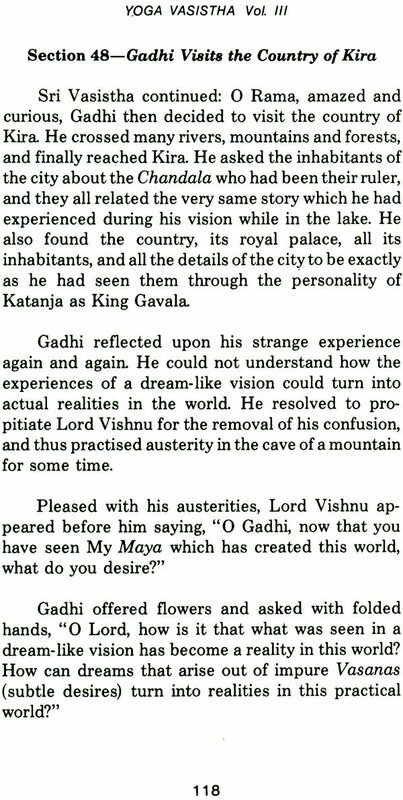 It was written by the great poet Valmiki (probably about 500 B.C., although maybe much earlier) in the form of dialogue between Sage Vasistha and his pupil, the young prince Rama. Every kind of exposition is employed in its sequence - didactic instruction, answers to doubts, parables, and stories within stories, Many key points of this metaphysical instruction are touched upon over and over again, with increasingly deeper meanings. 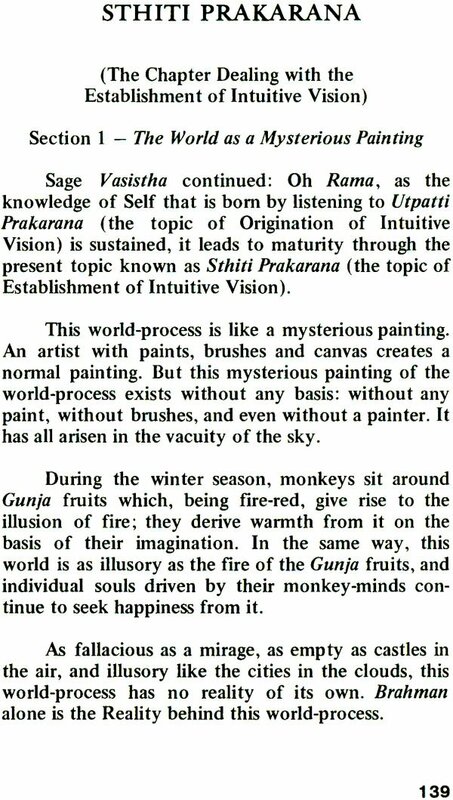 Therefore, the work appears to move in vast spirals, culminating in the Self-realization of Sri Rama. The interlocking system of stories within stories enhances the vision of worlds within worlds, and of the infinitely complex world of the mind, itself arising within the Cosmic Mind. 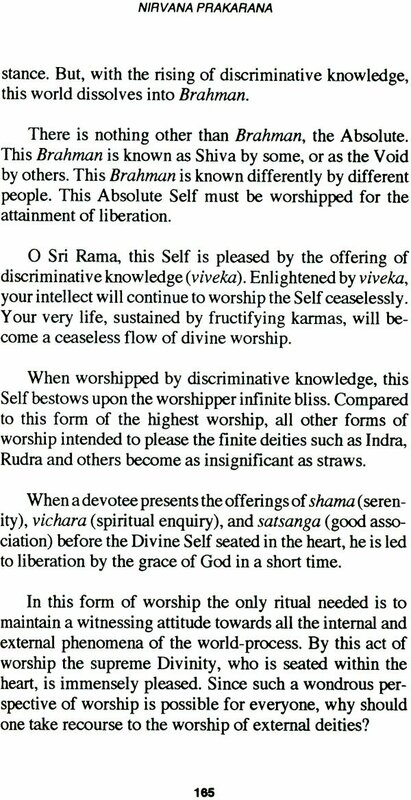 In the opening stage, Sri Rama relates his growing awareness of the transiency of life and of all worldly aims. 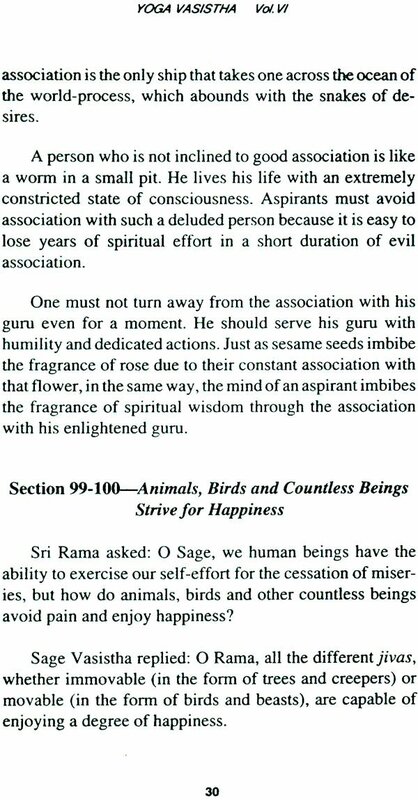 A great Vairagya (dispassion) arises, which later develops into Mumukshuttwa (longing for spiritual emancipation). 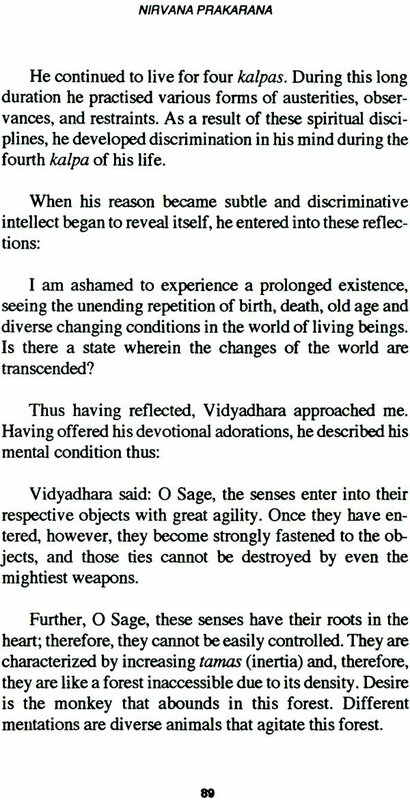 Subsequently, he is fully enlightened by Sage Vasistha. In the process, every aspect of Yogic and Vedantic teaching is beautifully and fully developed. 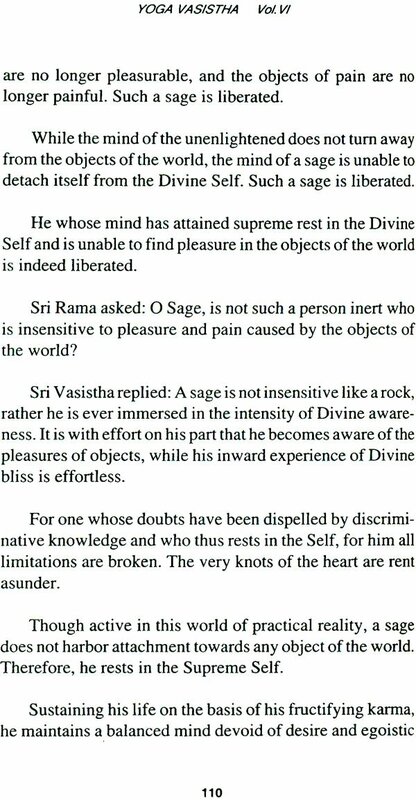 At Sage Vasistha's request, Sri Rama describes the cause of his mind's unusual melancholy state. 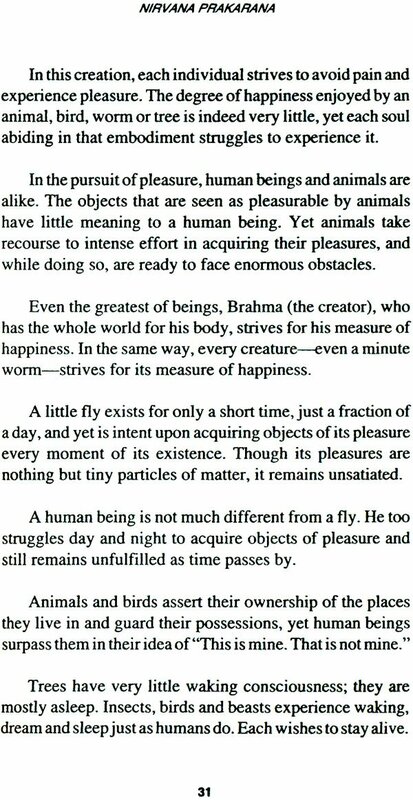 He elaborates upon the transiency, essencelessness, and changing nature of all objects in this world. 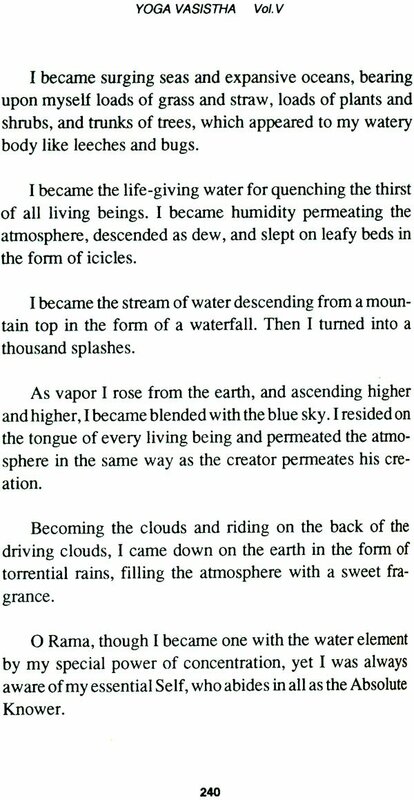 These vivid descriptions of the vanity of all worldly pleasures, and of the emptiness of all worldly glories. 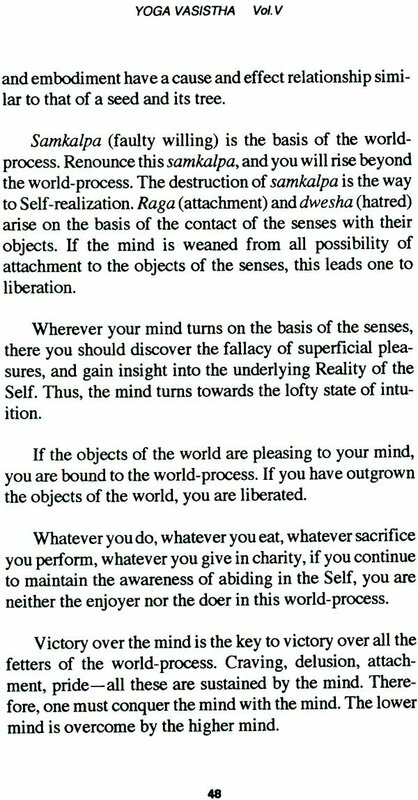 are meant to promote Vairagva (dispassion), which is the first basic requirement for treading 'the path of wisdom that leads to Self-realization. This section details upon the qualifications that are necessary before one can seek immortality. One should not rely on destiny, but rather, gain an insight into the fact that the Self in him is the ceaseless source of all energy and creativity. He should befriend one of the four gatekeepers of Liberation (serenity, contentment, spiritual enquiry, and good association). With the help of that one gatekeeper, he will automatically befriend the other three, and finally, enter into the blessed palace of Liberation.
" Utpatti Prakarana" is an exposition on how the world evolved from the Absolute and is ever rooted in the Absolute. In fact. the world .15 an appearance sustained by the limitations of the mind. When these limitations are overcome by intuitive wisdom, it becomes non-existent. 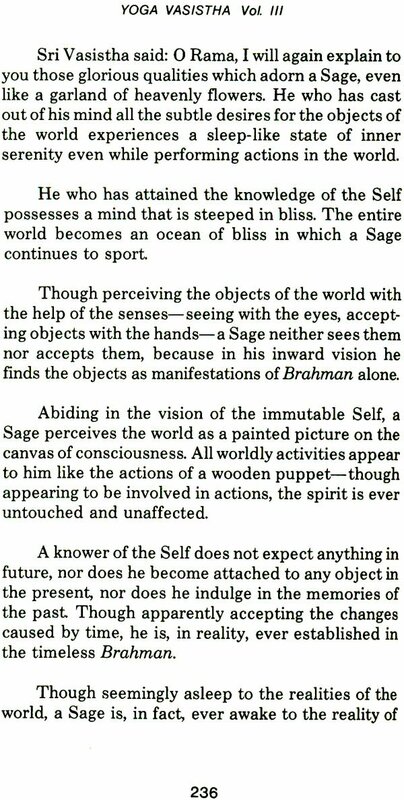 This section explains how an aspirant, having attained knowledge, can abide in Brahman, even though the world continues to appear. 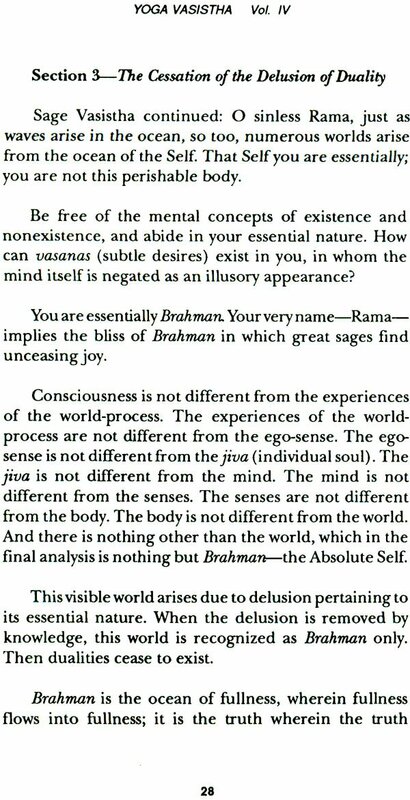 The underlying Reality behind the ego-sense in man is the Absolute. When the illusion of duality is negated by wisdom, a Yogi lives and sports in Brahman. The Self is realized as the creator as well as the enjoyer of the unrverse. 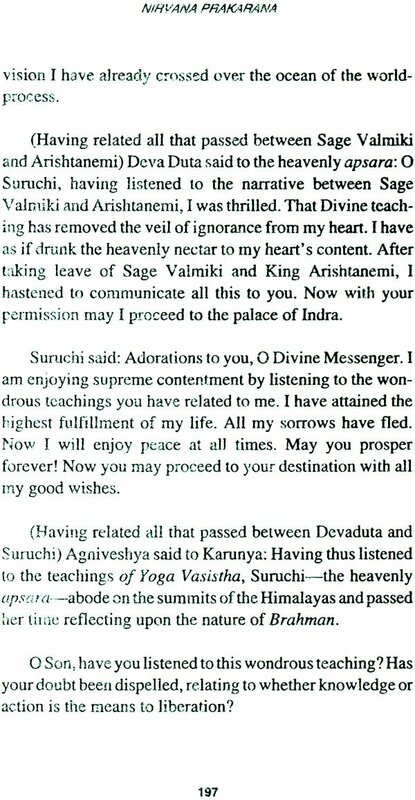 Herein Yoga Vasistha deals with the stupendous experience of peace that results from spiritual Enlightenment. 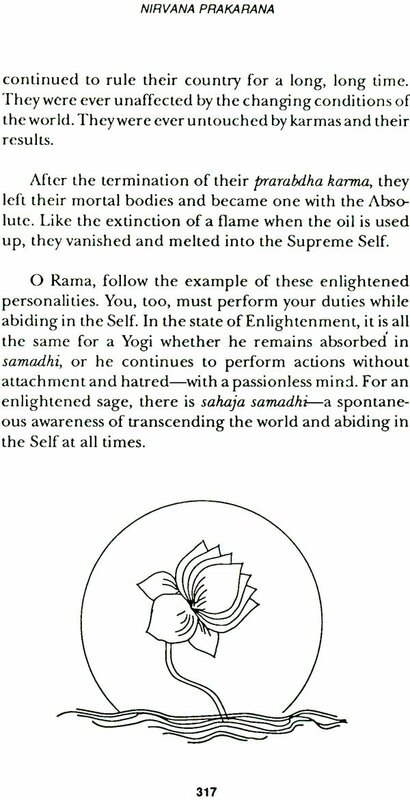 The characteristics of a Self-realized Sage are described in glowing terms, This section also gives instructions for the removal of Ahamkara (egoism), for the promotion of equal vision, and for the attainment of absolute detachment from the world-process. 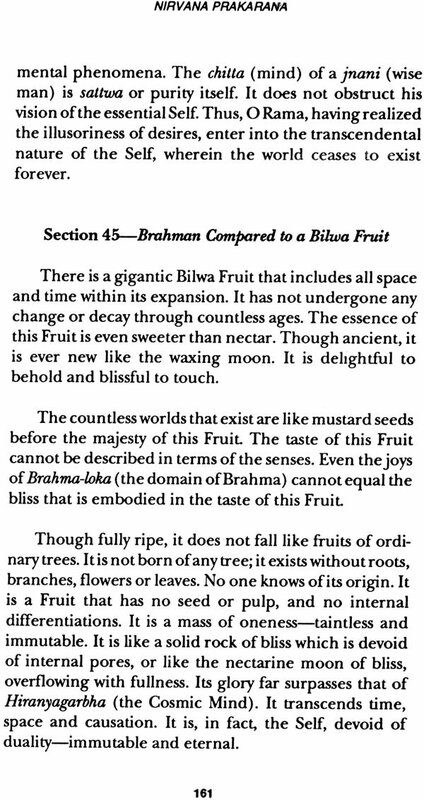 This voluminous section is divided in two parts: In the first, entitled Purva Bhaga, the Yogi discovers his essential nature. 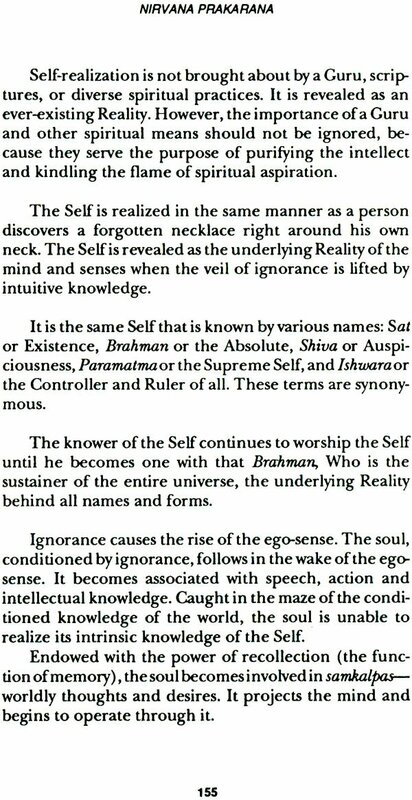 He realizes his true identity as Brahman, the underlying Reality behind all individual beings, as well as the universe. He becomes all that is. 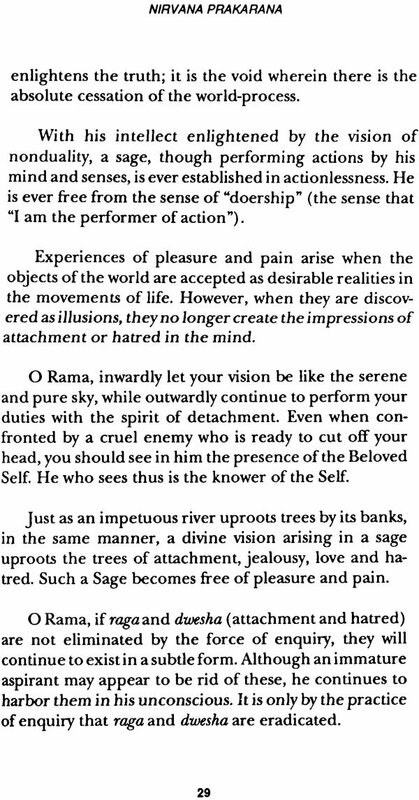 In this section, Sri Rama enters into divine ecstasy. 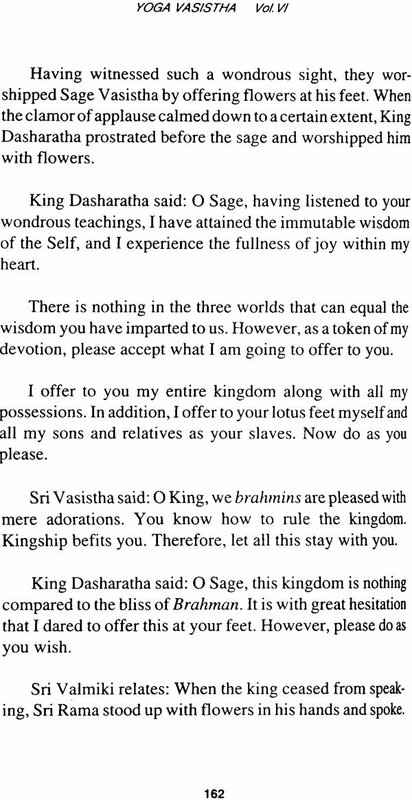 In the second part, Uttara Bhaga, Yoga Vasistha presents the beatific vision of Nirvana (Liberation), which is the extinction of all cravings. 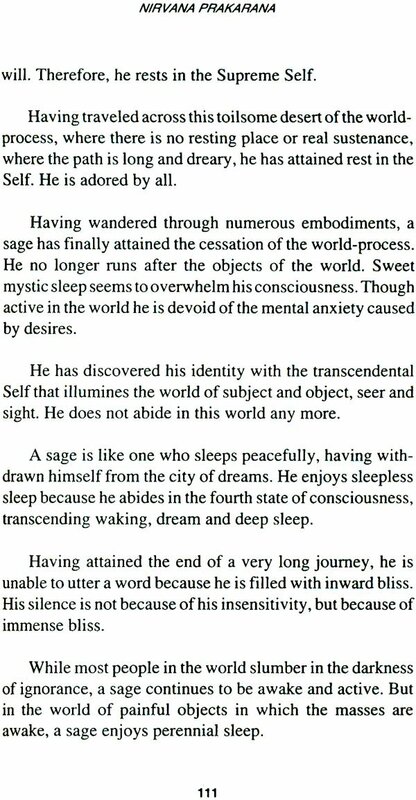 Sage Vasistha describes his own personal experiences of Samadhi and of the majestic vision of the entire universe being nothing but the Self. 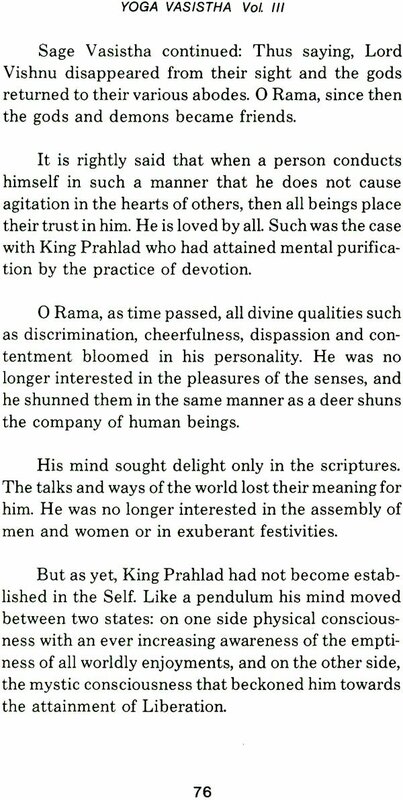 In conclusion, Sri Rama attained enlightenment. 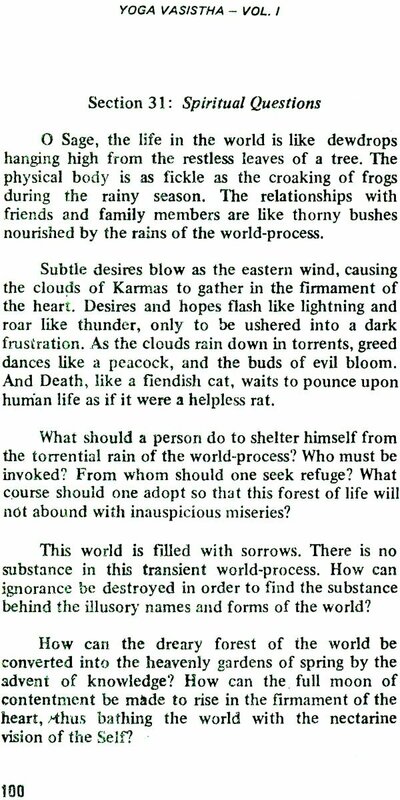 But instead of turning away from the practical duties of the world, he prepared himself to perform them even as the great Divinities who create, sustain and destroy the world - with a spirit of absolute detachment. 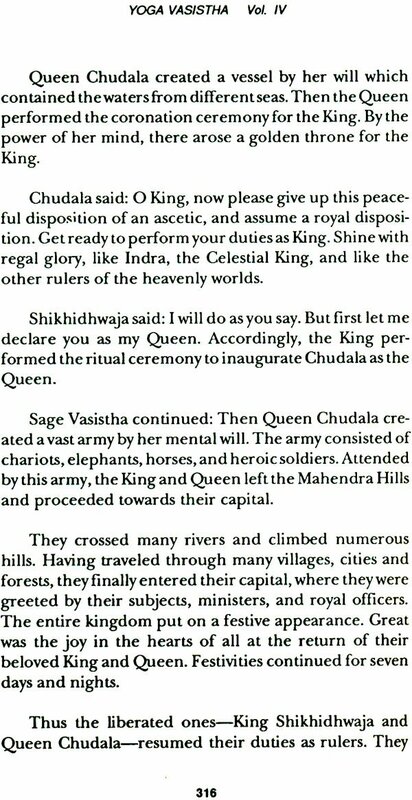 In the "Bala-Kanda" section of the Ramayana it is stated that Sri Rama was given spiritual instructions by Sage Vasistha. Yoga Vasistha, a complete and separate work in itself, is that teaching. While the Ramayana, the epic poem more popularly known throughout India and the world, describes the life and adventures of Sri Rama, the Yoga Vasistha presents his inner realization in detail for those who wish to intensify their spiritual life and deepen their understanding. 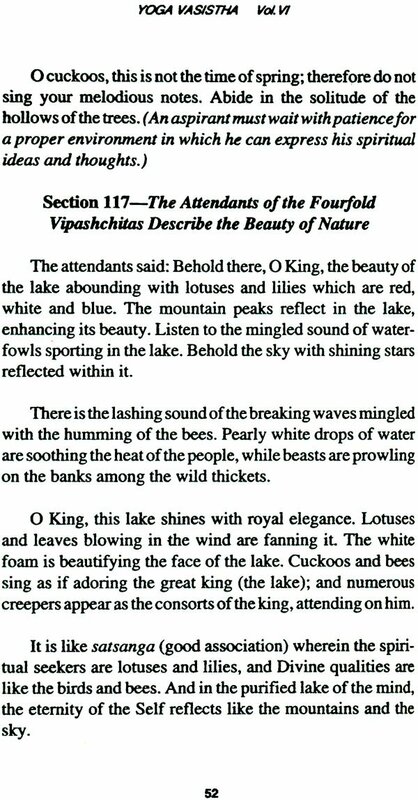 A vast work of approximately 32,000 verses, the Yoga Vasistha was written by the great poet-sage Valmiki, as was the Ramayana, about 500 B.C. or earlier. The Yoga Vasistha, which is virtually unknown in the West due to the scarcity of its English translations, is also known by the names of Maha-Ramayana, Uttar Ramayana, Arsha Ramayana, Jnana Vasistha, Vasistha Ramayana, and Vasistha. 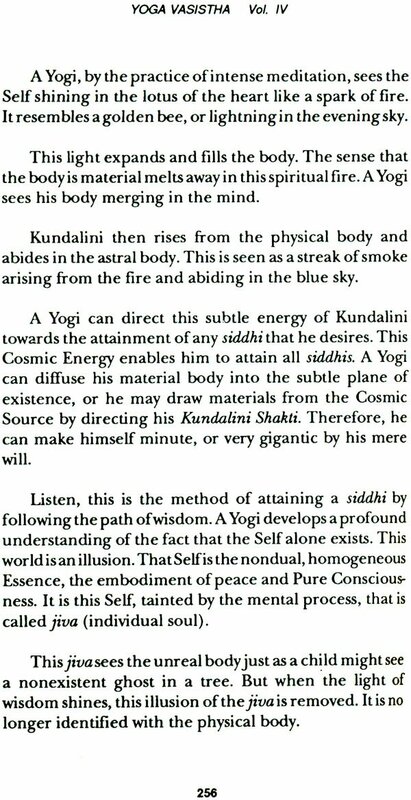 But whatever you choose to call it, it is the earliest detailed work of Yoga-Vedanta and gives a magnificent exposition of the subtleties and insights of that philosophy with a majestic sweep that has never been equalled in any metaphysical work since. Every kind of exposition is employed in its presentation - didactic instruction, answers to doubts, parables, and stories within stories. Here, for example, the interlocking system of stories within stories enhances the vision of worlds within worlds, and of the infinitely complex world of the mind, itself arising from the Cosmic Mind. 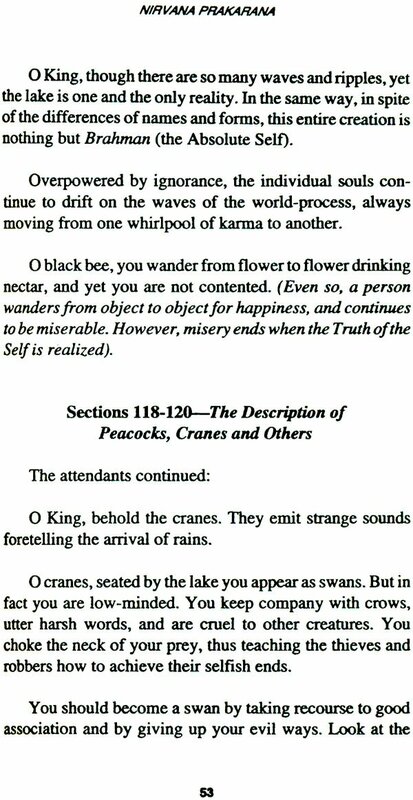 Many key points of this metaphysical instruction are touched upon over and over again with increasingly deeper meanings. Therefore the work appears to move in vast spirals, ultimately culminating in the Self- realization of Sri Rama. 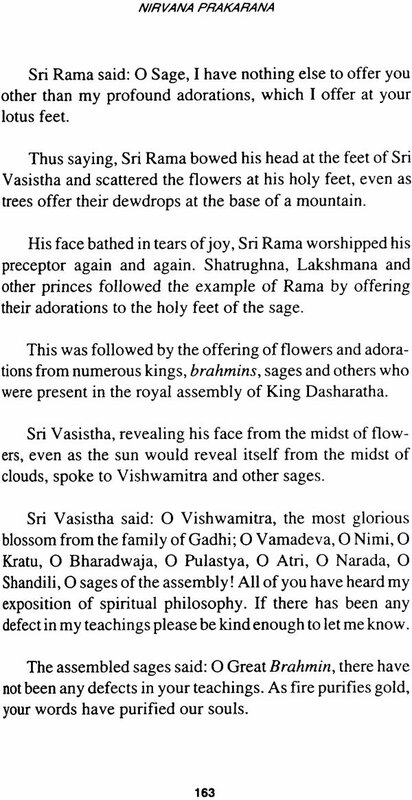 In "Vairagya Prakarana" of Volume l it will be remembered that Sage Vasistha asked Sri Rama to express the reasons for his depressed state of mind. 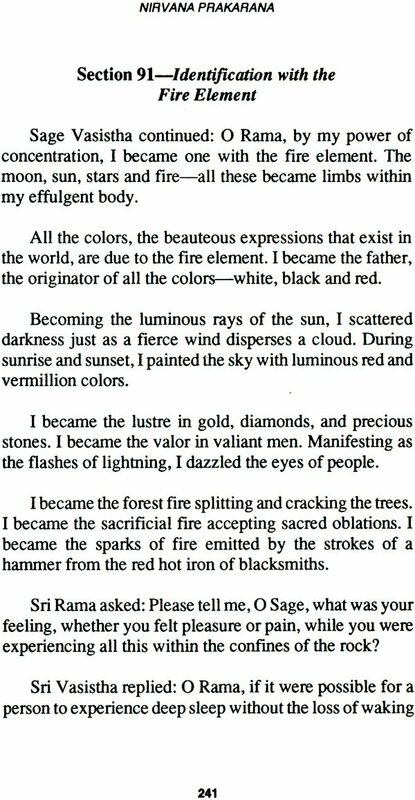 At this, Sri Rama elaborated upon the transiency and essencelessness of all objects of the world. 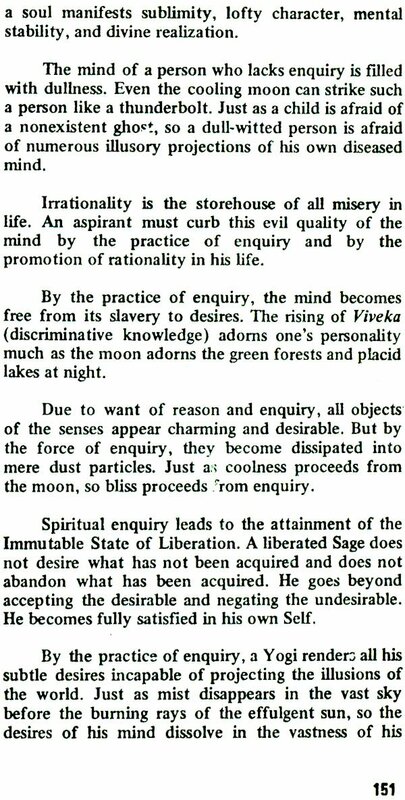 All that he once thought to be of value and a source of happiness has, through the vision of his penetrative intellect, become nothing but a source of emptiness and misery. 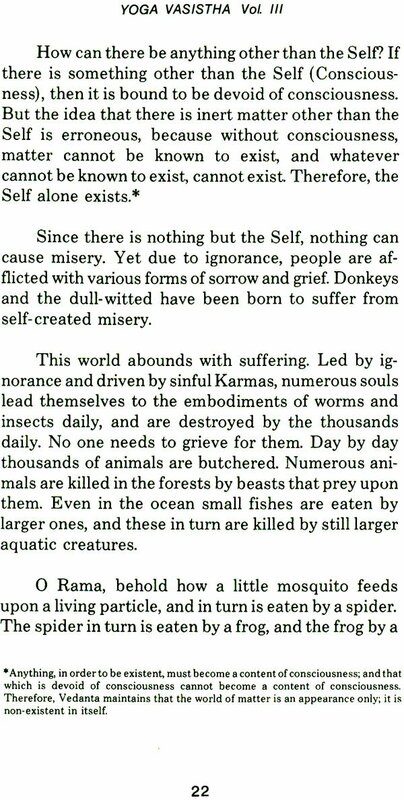 In the first section, therefore, Sri Rama has taken what is normally the most valued aspects of life and has shown how illusory they are. 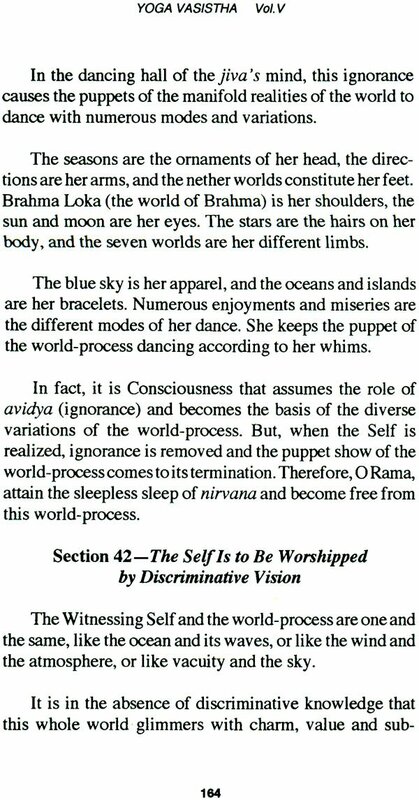 The purpose here is to promote dispassion (Vairagya) in the aspirant. 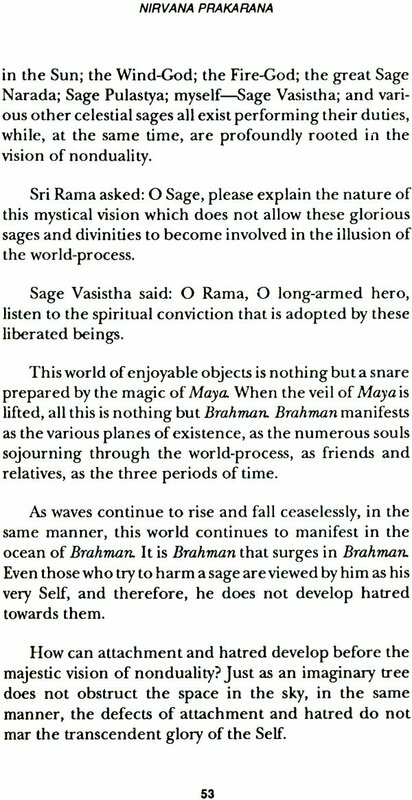 Such Vairagya considers all pleasures of the world, from the lowest form of life to the highest - that of Brahma the Creator- as insignificant and illusory. 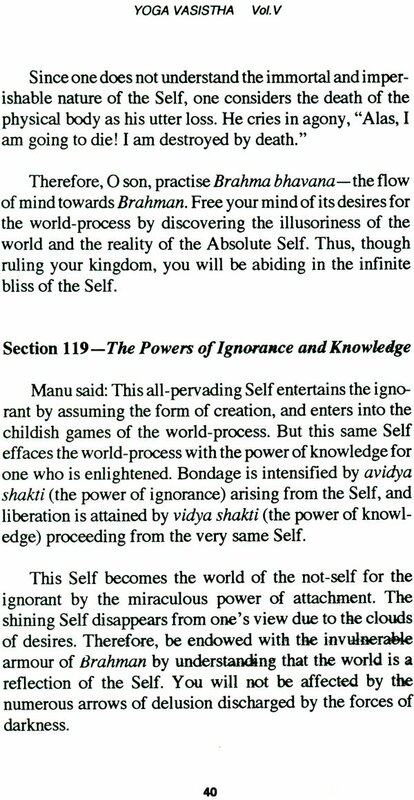 This is the first and fundamental requirement on the path of wisdom that leads to Self-realization. 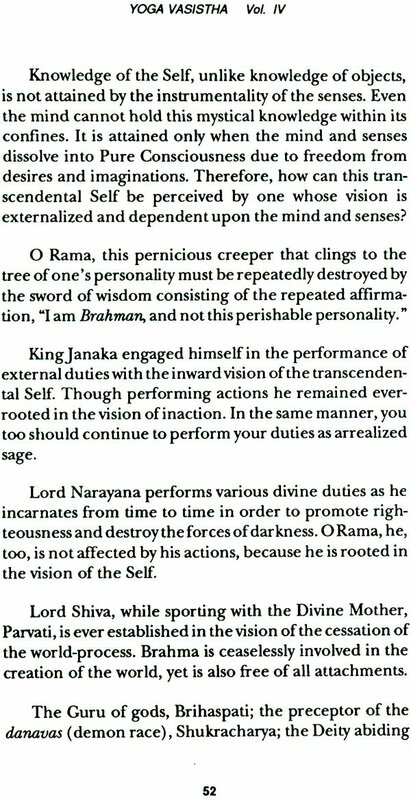 In the second section, "Mumukshu Prakarana," it has been shown that certain qualifications are necessary for an aspirant before he can effectively move on the path towards the state of immortality or Self-realization. 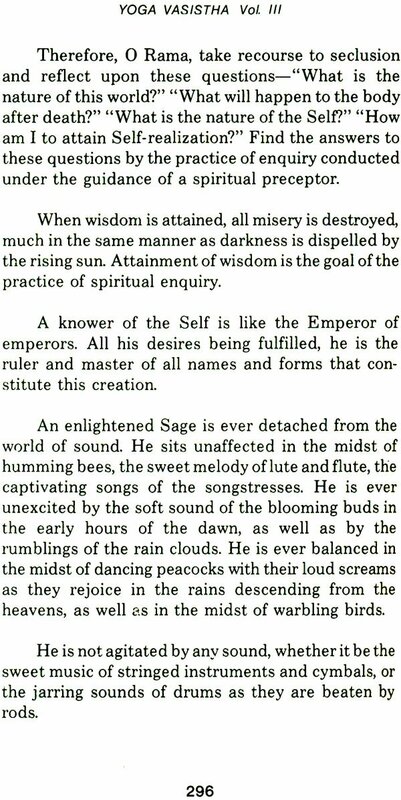 Sage Vasistha, therefore, elaborated on the four most important qualifications-those of Serenity, Contentment, Spiritual Enquiry and Good Association. In addition, "Mumukshu Prakarana" elaborated on how the aspirant should not rely on destiny, rather on his own self-effort. The Self within is unlimited, and each person has that same potential within - all that is needed to unlock that infinite potential and creativity is repeated self-effort. 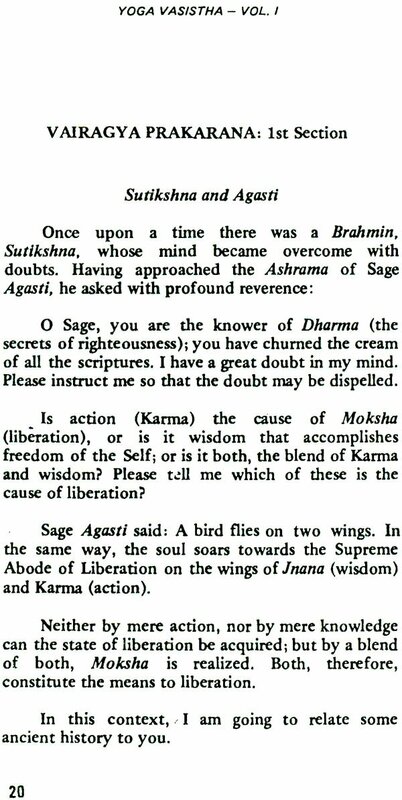 In "Utpatti Prakarana," Sage Vasistha has shown how the world has evolved from and is sustained by the Absolute through the limitations of the mind. And since the world is merely a protection of the mind conditioned by ignorance, when ignorance is overcome by intuitive wisdom, mind re- discovers its unity with the Cosmic Mind and the Individual merges into the Absolute. At this point, the entire world-process is remembered to be no- thing but a long dream of the mind from which one has awaken. It was in this section that the first volume ended and the present volume now continues. 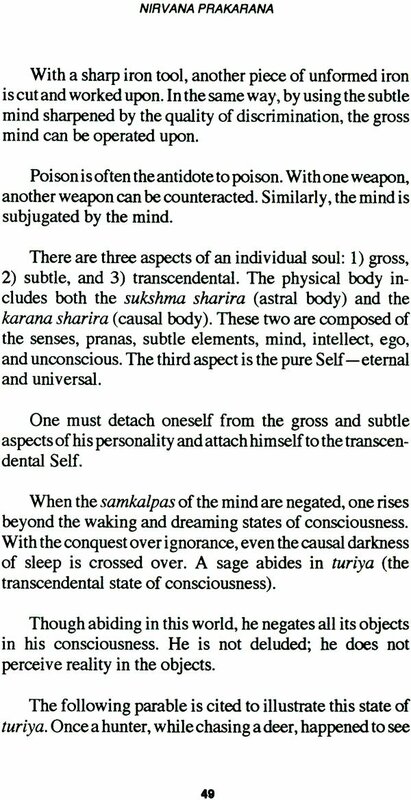 After completing "Utpatti Prakarana," Sage Vasistha goes into "Sthiti Prakarana" which deals with the sustaining reality of the Self, and then on into "Upashama Prakarana," the topic dealing with the quiesence of the mind. 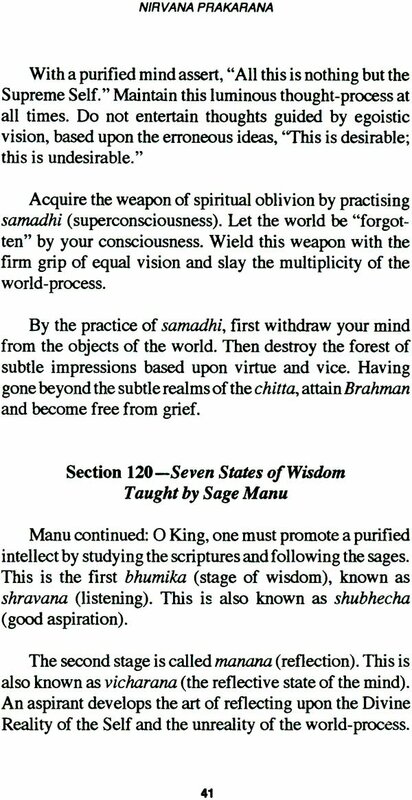 Volume III will pick up here and will continue on into the last and final section, "Nirvana Prakarana," the topic dealing with the final stage of Sri Rama's instruction from Sage Vasistha, and his ultimate Enlightenment.